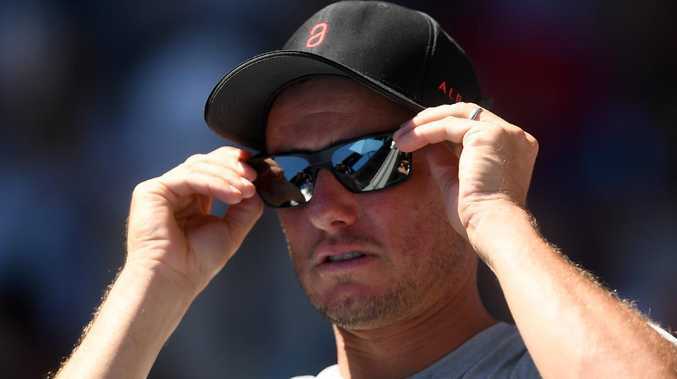 LLEYTON Hewitt has responded to Bernard Tomic's astonishing verbal attack, saying he laughed off criticism from the tennis star. After producing an honourable loss to Australian Open sixth seed Marin Cilic, Tomic launched a scathing attack on Davis Cup captain Hewitt. Tomic suggested bias towards and promotion of players loyal to Hewitt and his management company - and in doing so implicated both Nick Kyrgios and Thanasi Kokkinakis ahead of their Australian Open starts. Speaking to Channel 9 on Tuesday, Hewitt steered clear of engaging in a slanging match but was unhappy Tomic's serve took attention away from the impressive performances of Aussies at their home grand slam. 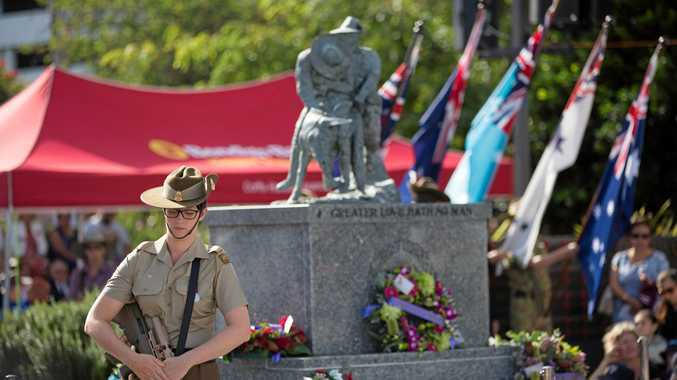 "I had a bit of a laugh actually," Hewitt said. "It's Bernie being Bernie, especially after a loss last night and going in and complaining about a few things. "For me, I just laugh it off and move forward and obviously working with so many of the guys ... I am excited. "I guess the disappointing thing is the Aussies had such a great day yesterday on the men and women's side and it probably got overshadowed by Bernie's comments." 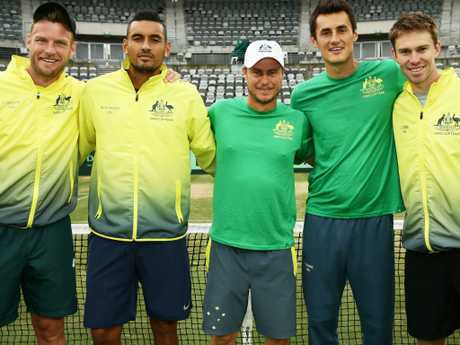 Hewitt denied there was a rift between him and Australian talent in the running to represent their country in the Davis Cup, even after Tomic suggested Kyrgios and Kokkinakis were also unhappy with the Aussie legend. "I don't think that there's a rift," Hewitt said. "There's always communication going on between the captain, the coaches and the players and leading into the next tie that will all happen. "But these boys are going on for big matches today and the communication, we've spoken before the Australian Open, we'll continue to speak after the Australian Open leading into the next Davis Cup tie. "Then we work out next week our best team moving forward for the Adelaide tie. "I just love being part and helping the Australian players as much as possible." Tomic went nuclear on Hewitt on Monday night, preferring to criticise the last Australian male to win a major singles title over discussing his own first-round exit..
"We have a lot of issues that not a lot of players are happy about," Tomic said when first asked if he expected to play Davis Cup this year. "The players that I have spoken to aren't. Myself, Kokkinakis, Kyrgios. I think once that sort of gets resolved we'll see. "I stand by my call a couple years ago. I knew something was wrong in the Davis Cup. And now there is Kokkinakis and Nick as well who aren't playing because they have issues with some people. "Hopefully that can be arranged and the best players can be playing for Australia." Tomic said he, Kyrgios and Kokkinakis would only consider returning to play Davis Cup when "the best players in Australia" were being selected to play the singles rubbers. Tomic also took an extraordinary pot shot at Hewitt for playing himself in Davis Cup doubles rubbers at the expense of younger players. "It's all Lleyton. I'm going to say it honestly. No one likes him anymore," Tomic said. The pair aren’t on the same page. His most dramatic accusation was a suggestion there was a conspiracy in the Davis Cup camp to favour players who belonged to Hewitt's management company. 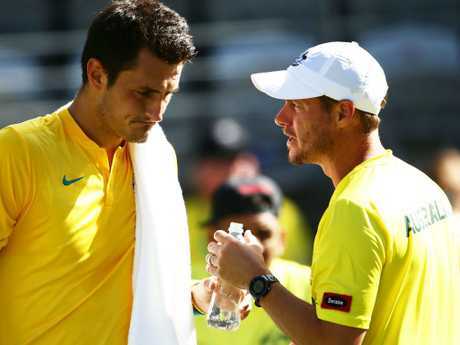 Tomic said fellow disgruntled Aussie players had told him Hewitt had not put them first. "He doesn't put the players first. He doesn't put Nick first. He doesn't put Kokkinakis first. "He always thinks of himself and it's not good. You're not playing any more bro. You're retired. It's not good. Wally was a great captain. Wally Masur was an unbelievable Davis Cup captain. He was somebody everyone liked." The tirade sent social media into meltdown but some analysts seemed to think Tomic might have hit a nerve, even if his point was made at the wrong time. Unsurprisingly other tennis luminaries came out to support Hewitt. Todd Woodbridge led the charge and described it as a "poor attempt to deflect". Hewitt's former coach Roger Rasheed also weighed in to throw his support behind the two-time slam winner. "I think those comments, they're not warranted," Rasheed told Sky Sports Radio. "(Hewitt) gave everything to the sport and you've got someone having pot shots. Regardless of what the situation is I don't think it's the right thing to do. "For Bernie I'd love him to just put his head down, get himself in the condition that he needs to be to play tennis at a professional level, day in day out, week in week out, and offer himself to the challenge. But at the moment we don't see that product."